The dictionary states that a splinter is a small, thin, sharp piece of wood, glass, or similar material broken off from a larger piece. Now what will you do if you got a splinter lodged under the skin of your thigh? Another skateboarder trying to remove the giant splinter. The man in the video below got his friends to help him out, of course! 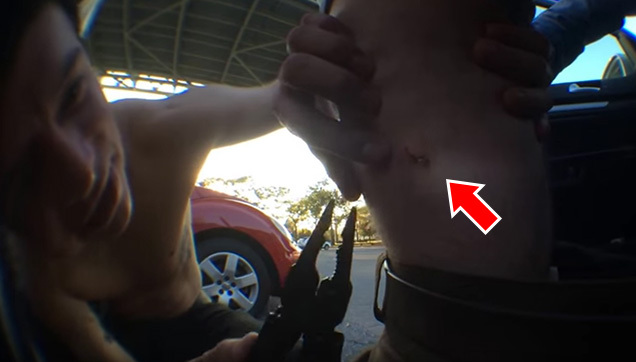 With a pair of pliers in hand, his friend crouched low to eye level with where the splinter seemed to have lodged itself in. He gingerly pulled it out but what shocked them the most was that the splinter was about two-three inches long! It felt so good [to have the splinter removed]. And it may have been a disgusting sight to see but we're glad he got it off his thigh to say the least!